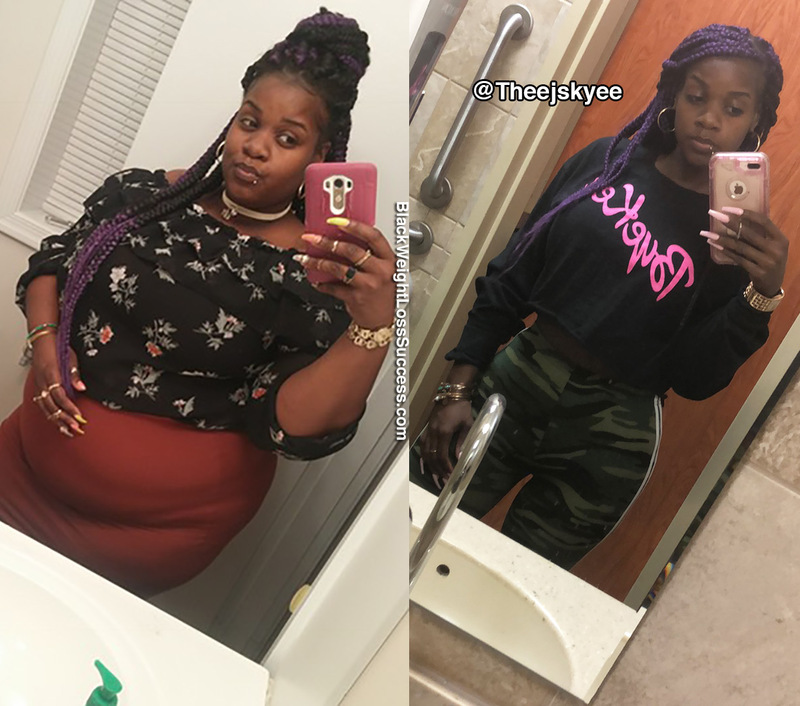 Transformation of the Day: Janay lost 165 pounds. At 25 years old, her health was significantly impacted by the weight she was carrying. 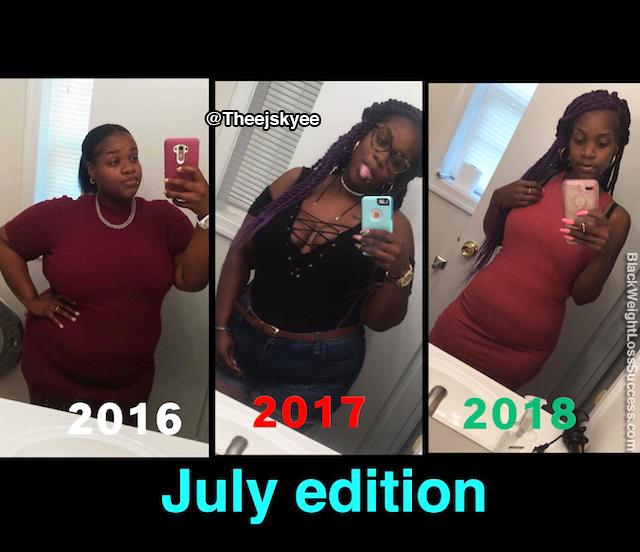 She says that having the Gastric Sleeve procedure was her last resort and it hasn’t been easy, but it’s definitely changed her life for the better. Check out her transformation story. At just 25 years old, I was morbidly obese and on my way to encountering multiple health issues that run in the family. I also had terrible asthma my whole life. It was becoming harder and harder to lose weight and keep it off, because I was on various medications and dealing with health issues. I started my weight loss journey in August 2016. After years of struggling with my weight and failed attempts to lose weight, I decided to turn to Gastric Sleeve weight loss surgery. I did a small Pre-Op liquid diet before surgery. I had Gastric Sleeve surgery on February 28, 2017. It has changed my life and helped me get my health back on track. How did you change your eating habits? My relationship with food has changed tremendously. I’m always so conscious about what I eat. My normal diet is high-protein, low carb and low sugar. (So, more Keto than anything) I have treats in moderation. Snacking is so different for me now… I have just a taste of something and that’s about it. What does your workout routine look like? Initially, I was doing Zumba twice a week and a mix of my own workout routine at the gym. Now, I just work out at the gym. 2-4 days a week, I do cardio for 30 minutes and strength training for 30 minutes. Now that I’ve hit my goal weight, I rotate as much is I can to focus on toning my body and maintaining what I’ve worked to lose. What is your starting weight? What is your current weight? My starting weight was 315 pounds and my current weight is 150 pounds. I am 5’3″. What is the biggest lesson you’ve learned? No matter what route you take to lose weight and get healthy, it’s going to be hard work. Even if you have surgery, like I did, you have to mentally prepare yourself for the changes that your body is going to go through. You have to prepare yourself for the pain that you’re going to have to endure while healing and learning how to eat all over again. You have to adjust to your new stomach and change your relationship with food if you want to maintain your weight loss after surgery. You can’t use food as a crutch when you go to events and celebrations. You can’t really indulge like you did before. So, your relationship with food really changes completely. You have to look at food as a source of survival. Eat just to stay alive and stay satisfied, but nothing more. You really have to prepare yourself, otherwise you’re going to end up right back where you were before you started your weight loss journey. What advice would you like to share? Do what is best for you. If you can mentally handle the changes of getting surgery, I say go for it. It’s definitely a good option for long-term weight loss, but it’s also just a tool. You have to do a lot of the work yourself. You can’t just depend on your sleeve or your bypass to do all the work. You still have to exercise and watch what you eat. Get a support group. Find a good team of people who want to see you do well and who are down to help you. Surround yourself with positive people who support you and encourage you. If you can’t find people, encourage and support yourself. Avoid negative people. Negative people always bring you down and discourage you from doing what’s right for you, because they are not doing what’s right for themselves. They don’t care if you succeed. Always do what you want to do for yourself, regardless of what other people think. That’s going to be your biggest key to success. Weight loss surgery was my last resort, but definitely the best decision I’ve ever made. It has helped me turn my life around and get to a healthy weight for the first time in my life. My asthma has improved tremendously. My risk levels for high blood pressure and diabetes have also lessened. Now, maintaining my weight is my goal. Keeping a life of healthy eating and exercise is my lifelong goal. I’m also encouraging others to get healthy in the best way that works for them. Girl, you did it! Congrats on an awesome job!! !